This genus is accepted, and its native range is Assam to S. China and N. Australia. Annual (1), or perennial (1). Culms 30-100-150 cm long; with prop roots (1/1). Ligule a ciliolate membrane. Leaf-blades linear, or lanceolate (1). Monoecious; with male terminal and mixed axillary inflorescences. Synflorescence simple (1), or compound (1); fasciculate (1/1). Inflorescence composed of racemes; axillary; subtended by a spatheole; embraced at base by subtending leaf. Spatheole lanceolate; herbaceous. Racemes single, or digitate (1); bearing few fertile spikelets; bearing 3-6 fertile spikelets on each, or 7 fertile spikelets on each (1). Rhachis fragile at the nodes; flattened (1), or subterete (1). Rhachis internodes oblong (1), or clavate (1); bearing a sterile companion laterally. Rhachis internode tip cupuliform (1), or crateriform (1). Sexes segregated; on unisexual branches (1), or bisexual branches; with male above, or below (1). Spikelets embracing internode; in pairs. Fertile spikelets sessile; 1 in the cluster. Companion sterile spikelets pedicelled; 1 in the cluster. Male spikelets sessile and pedicelled; 2 in a cluster. Pedicels fused to internode. Male inflorescence of subdigitate racemes. Male spikelets distinct from female; ovate (1/1). Male spikelet glumes 2; muticous (1), or awned (1). Companion sterile spikelets represented by single glumes; separately deciduous. Spikelets comprising 1 basal sterile florets (1/1); 1 fertile florets; without rhachilla extension. Spikelets oblong; dorsally compressed; 6-6.5-7 mm long; falling entire; deciduous with accessory branch structures. Spikelet callus base truncate; with central peg; attached transversely. Companion sterile spikelets represented by single glumes; separately deciduous. Spikelets comprising 1 basal sterile florets (1/1); 1 fertile florets; without rhachilla extension. Spikelets oblong; dorsally compressed; 6-6.5-7 mm long; falling entire; deciduous with accessory branch structures. Spikelet callus base truncate; with central peg; attached transversely. Glumes exceeding apex of florets; firmer than fertile lemma. Lower glume elliptic (1), or oblong (1); indurate; 2-keeled; winged on keel. Lower glume surface not waisted (1), or laterally waisted (1); pubescent (1), or villous (1). Lower glume apex entire, or erose (1); emarginate (1), or obtuse. Upper glume elliptic (1), or oblong (1); coriaceous; without keels (1/1); 7 -veined (1/1). Upper glume apex acuminate (1), or caudate (1). Basal sterile florets barren (1/1); without significant palea (1/1). Lemma of lower sterile floret oblong (1/1); cartilaginous (1/1); acuminate (1/1). Fertile florets female. Fertile lemma oblong; hyaline (1), or cartilaginous (1); without keel; 9 -veined (1/1). Lemma apex acuminate (1), or cuspidate (1). Palea 0.75 length of lemma; hyaline; 1 -veined (1/1); without keels. Caryopsis with adherent pericarp; square (1/1); flattened (1/1); concavo-convex (1/1). Hilum punctiform. Male inflorescence of subdigitate racemes. Male spikelets distinct from female; ovate (1/1). Male spikelet glumes 2; muticous (1), or awned (1). Annual (6), or perennial (3). Rhizomes absent (8), or elongated (1). 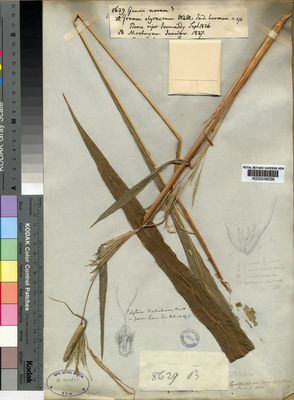 Culms erect (6), or decumbent (3); reed-like (1/5), or robust (4/5); 20-120.2-300 cm long; with prop roots (1/3), or rooting from lower nodes (2/3). Culm-internodes terete (1/3), or channelled (2/3). Lateral branches lacking (1/4), or sparse (1/4), or ample (3/4). Leaf-sheath auricles absent, or erect (1). Ligule an eciliate membrane (5), or a ciliolate membrane (2), or a ciliate membrane (1), or a fringe of hairs (1). Leaf-blade base without a false petiole (8), or with a false petiole (1). Leaf-blades linear (8), or lanceolate (3), or oblong (1); firm (8), or flaccid (1). Leaf-blade margins cartilaginous (4/4). Monoecious; with male and female spikelets in the same inflorescence. Synflorescence simple (5), or compound (4); paniculate (3/3). Inflorescence composed of racemes; terminal and axillary (7), or axillary (2); subtended by a spatheole; exserted (2), or embraced at base by subtending leaf (6), or enclosed (1). Spatheole linear (2/7), or lanceolate (5/7); herbaceous (3/5), or scarious (2/5). Peduncle widened at apex (3/3). Racemes single; unilateral (2/2); bearing few fertile spikelets (8), or many spikelets (1); bearing 1 fertile spikelets on each (3/7), or 2 fertile spikelets on each (4/7), or 3 fertile spikelets on each (2/7), or 4-6 fertile spikelets on each (1/7). Rhachis fragile at the nodes; flattened (1/7), or subterete (6/7). Rhachis internodes linear (7), or columnar (1), or oblong (1); bearing a sterile companion laterally. Rhachis internode tip transverse (7/7); cupuliform (5), or crateriform (4). Sexes mixed (1), or segregated (8); on bisexual branches (8/8); with male above (8/8). Spikelets embracing internode; solitary (1), or in pairs. Fertile spikelets sessile; 1 in the cluster. Companion sterile spikelets pedicelled; 0 in the cluster (2), or 1 in the cluster. Male spikelets sessile and pedicelled; 1 in a cluster (2), or 2 in a cluster (8), or 3 in a cluster (2). Pedicels free (1), or fused to internode (8); filiform (1/1). Companion sterile spikelets absent (1), or represented by barren pedicels (2), or rudimentary (6), or well-developed (3); deciduous with the fertile (2/2). Spikelets comprising 1 basal sterile florets; 1 fertile florets; without rhachilla extension. Spikelets lanceolate (2), or oblong (7); dorsally compressed; 4-8.728-18 mm long; falling entire; deciduous with accessory branch structures. Spikelet callus brief (8), or square (1); base truncate; simple (1), or with central peg (8); attached transversely. Male spikelets resembling female (2), or distinct from female (7); lanceolate (5/7), or elliptic (1/7), or oblong (1/7), or ovate (1/7), or obovate (1/7). Male spikelet glumes 2. Companion sterile spikelets absent (1), or represented by barren pedicels (2), or rudimentary (6), or well-developed (3); deciduous with the fertile (2/2). Spikelets comprising 1 basal sterile florets; 1 fertile florets; without rhachilla extension. Spikelets lanceolate (2), or oblong (7); dorsally compressed; 4-8.728-18 mm long; falling entire; deciduous with accessory branch structures. Spikelet callus brief (8), or square (1); base truncate; simple (1), or with central peg (8); attached transversely. Glumes exceeding apex of florets; firmer than fertile lemma. Lower glume lanceolate (2), or elliptic (2), or oblong (3), or ovate (2); chartaceous (1), or coriaceous (3), or indurate (5); without keels (5), or 2-keeled (4); wingless (2), or winged on keel (4), or winged on margins (3). Lower glume surface smooth (6), or asperulous (3); not waisted (7), or transversely waisted (2). Lower glume apex entire (8), or dentate (1); 2 -fid (1/1); emarginate (3/8), or obtuse (5/8), or acute (1/8). Upper glume lanceolate (1), or elliptic (2), or oblong (1), or ovate (6), or orbicular (1); membranous (1), or chartaceous (1), or herbaceous (2), or cartilaginous (4), or coriaceous (3); without keels (3/3); 3-4 -veined (1/4), or 5 -veined (2/4), or 6-7 -veined (1/4), or 9-14 -veined (1/4), or 15 -veined (2/4), or 16-17 -veined (1/4). Upper glume apex acute (3/7), or acuminate (1/7), or cuspidate (3/7). Basal sterile florets barren; with palea (1), or without significant palea. Lemma of lower sterile floret lanceolate (1), or elliptic (2), or oblong (2), or ovate (6); hyaline (7), or membranous (2); 3 -veined (5/5), or 4-5 -veined (1/5); acute (2/3), or cuspidate (1/3). Fertile florets female. Fertile lemma lanceolate (6), or oblong (3), or ovate (3); hyaline; without keel; 1 -veined (2/5), or 3 -veined (3/5). Lemma apex truncate (1/6), or acute (5/6). Palea 1 length of lemma; hyaline; 0 -veined (1/1); without keels (4), or 2-keeled (5). Palea apex dentate (1/1). Lodicules absent (3/3). Anthers 3 (4/4). Caryopsis with adherent pericarp (5/5); oblong (1/1); dorsally compressed (1/1). Embryo 0.75 length of caryopsis. Hilum punctiform (5/5). Male spikelets resembling female (2), or distinct from female (7); lanceolate (5/7), or elliptic (1/7), or oblong (1/7), or ovate (1/7), or obovate (1/7). Male spikelet glumes 2. Temperate Asia (1), or Tropical Asia, or Australasia (2), or Pacific (1). Polytoca semiteres Benth. ex Hook.f. Polytoca wallichiana (Nees ex Steud.) Benth.